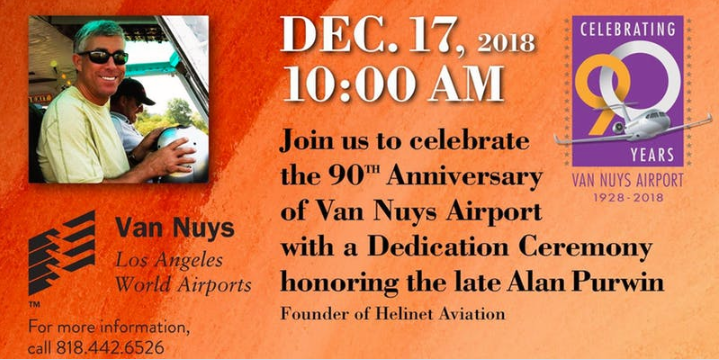 Join us to celebrate the 90th Anniversary of Van Nuys Airport with a dedication ceremony honoring the late Alan Purwin of Helinet Aviation. The speaking program features Board of Airport Commissioner Jeffery Daar; Flora Margheritis, CM, Van Nuys Airport Manager and Kathryn Purwin, Helinet Aviation, followed by a dedication ceremony for the helicopter themed play structure honoring Alan Purwin. On Van Nuys Airport’s 90th anniversary, we pay tribute to the aviation pioneers and visionaries who first introduced the San Fernando Valley to the freedom of flight. Dedicated on the twenty-fifth anniversary of the Wright Brothers’ first powered flight, VNY’s legacy is engraved in aviation history, attracting legendary pilots such as Amelia Earhart. The original dirt airstrip surrounded by farmland has become Los Angeles’ business airport and one of the world’s busiest general aviation airfields. As we honor the airport’s proud past, we also look forward to its promising future. Its potential to shape the future of private air travel is unparalleled. In honor of Alan David Purwin, founder of Helinet Aviation, a helicopter-themed play structure has been installed at the VNY Observation Area. Youngsters can play in the helicopter’s interactive 3D cockpit as make-believe pilots. Purwinwas an American helicopter pilot, aerial film operator, entrepreneur and philanthropist. During his career, he contributed to the aerial cinematography industry and aided in the filming of hundreds of Hollywood movies. On September 11, 2015, while working on the film American Made with Aerial Coordinator Fred North and Aerial Director of Photography Goss Dylan, Purwin died in a helicopter crash in the Andean natural region of Colombia. Light refreshments will be served. Hope to see you there to celebrate with us!